The first church on the site that is now Altab Ali Park was built in the mid thirteenth century, dedicated to Mary and from the outset identified as ‘de Matefelun’. This, which became Matfelon, may derive from a family name; Richard Matefelun, a wine merchant, is said to have been present in the area in 1230. If this is the derivation (matfelon as meaning knapweed is the least preposterous of numerous suggested alternatives), it was presumably in recognition of a pious benefaction, maybe prompted by local need. There was significant population growth in the area, and the existing parish church of St Dunstan, Stepney, was distant. Archaeological evidence indicates that the church was of clunch or white chalk rubble. 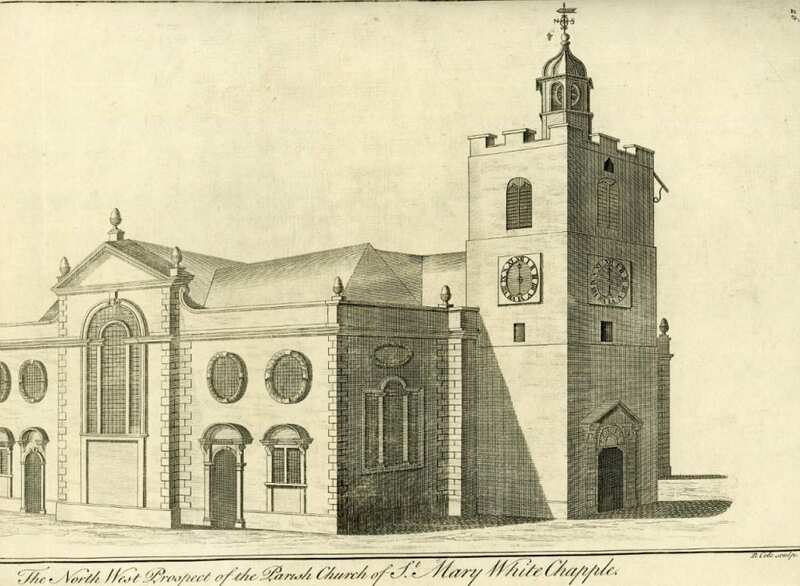 It thus, no doubt, came to be known as the ‘white chapel’, an appellation in use by 1344. Clunch was not uncommon in medieval churches, especially east and north of London, but it is friable so was often mixed with other materials. The church was reportedly wrecked in a storm and restored in 1362 thanks, it is said, to a papal Bull negotiated by the absentee rector, Sir David Gower, a Canon of St Patrick’s Cathedral, Dublin, that promised sinners a remission of penance for visiting Whitechapel with an offering. There were four priests in 1416 indicating a large congregation or at least a prospering parish. Documentation of legacies and archaeology both point to fifteenth-century improvements, to doors and windows if not more. Exceptionally, there were no chantries at the Reformation, when, in 1548, there were 670 communicants. View of the 1670s church (Reproduced by kind permission of Tower Hamlets Local History Library and Archives). If you are having problems viewing images, please click here. Little is known of the form of this medieval church. It appears to have had a four-bay nave to which a three-stage tower and a north aisle and porch might have been fifteenth-century additions. 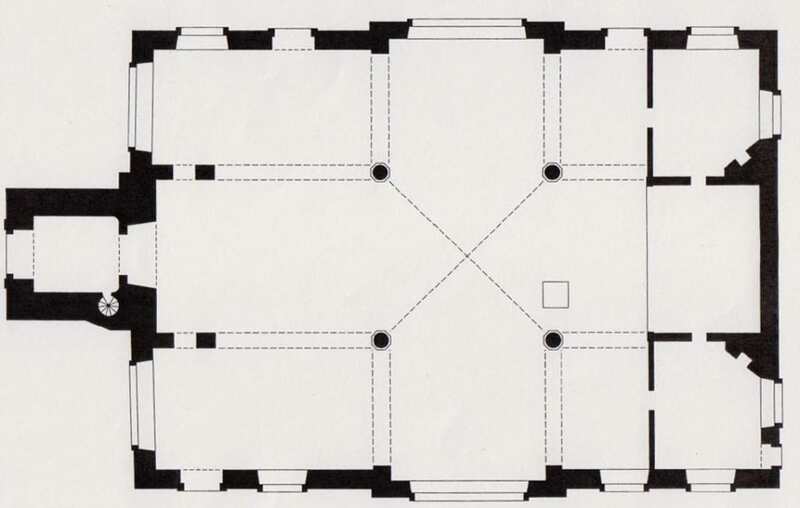 A south ‘aisle’ was added in 1591. This was, it seems, separately roofed, and almost as tall as the nave. More a room than an aisle it would have generated not just more seating for a growing congregation, but also a more auditory and less processional interior. That would have been in keeping with the Calvinist conventions of the late sixteenth century that were strongly represented in east London, where Protestantism sparked early. These norms were firmly upheld by Richard Gardiner, Whitechapel’s rector from 1570 to 1617. Prominent among Elizabethan puritans, Gardiner was embroiled in high-level religious–political controversy in the immediate run up to the extension of his church in 1591. Tellingly, during his time the vestry sold off the church organ. In 1618 William Crashawe, another outspoken and leading London puritan, became Whitechapel’s rector. He oversaw the insertion of a gallery in the south aisle which suggests that capacity was already again stretched. It bore a panel to celebrate the failure in 1623 of the Spanish Match. Crashawe died in 1626, preceded by 1,100 of his parishioners in the plague year of 1625. His successor in what his will called the ‘too greate Parishe’ of Whitechapel was John Johnson, another puritan, but one who married the daughter (Judith Meggs) of a wealthy parishioner in 1627 and trimmed thereafter to align with the anti-Calvinist tide headed by Bishop William Laud. Johnson moved the communion table to the east end of the church, and undertook beautifying repairs in 1633–4 with £300 raised from parishioners and more from the Haberdashers’ Company, which in making the grant took into account the relative poverty of the parish. Laud had strong local opposition and Johnson was among the first London clergy to be deprived of his living in 1641. Thomas Lambe’s General Baptists, formed in Whitechapel at this time, were ‘easily the most visible and notorious of all sectarian congregations in London’. After contested elections for parish overseers and violent confrontations in the church in 1646, Whitechapel’s Independents gained control and gathered under a new rector, Thomas Walley. When the tables turned at the Restoration in 1660 Johnson was reinstated and a schism resulted, most of the congregation departing to a meeting house in Brick Lane. In 1662 Walley was arrested preaching elsewhere in Whitechapel; he soon after emigrated to New England. Johnson was revealed as corrupt and deprived of his living in 1668, chiefly through the agency of his son-in-law, Ralph Davenant, who became Whitechapel’s next rector. A fellow of Trinity Hall, Cambridge, and a descendant of Bishop John Davenant, the moderate Calvinist who had represented the English church at the synod of Dort in 1618, he was also a cousin to the historian Thomas Fuller. Plan of the Church of St Mary Matfelon, Whitechapel, as rebuilt in 1672-3 (© Historic England). Under Davenant the largely medieval church was rebuilt in 1672–3. The principal benefactor was William Meggs, who had the parish’s largest house where Johnson, his brother-in-law, had lodged in the 1650s. Meggs had been a member of Johnson’s vestry from 1660. These links with Johnson notwithstanding, Crashawe’s panel of 1623 was relocated onto the new south gallery and a monument to Crashawe himelf was conspicuously re-erected on the north wall. Puritan inheritance was not obscured. In its architectural form the new brick-built church represented a rapprochement with moderate Nonconformity. It reused some old footings and lower parts of the tower, but in its regular cross-in-rectangle plan with shallow transept projections, it closely followed pre-Restoration Calvinist models at Westminster Broadway and Poplar (now the Church of St Matthias). While architects and builders remain unknown, there are circumstantial reasons for suspecting involvement on the part of Robert Hooke. The assuredly, if impurely, classical auditory interior was light and spacious. Though centralized, it had an east-west axis emphasized by three ribbed cross vaults supported by Portland stone Corinthian columns. There was a step up to the chancel, otherwise only articulated by the inclusion of flanking vestries. Shallow north and south galleries were probably original. Davenant was succeeded in 1681 by Dr William Payne, a latitudinarian, fellow of the Royal Society and leading Whig among London clergy who was keen to embrace dissenters. The liturgical politics of Whitechapel changed dramatically in 1697 with the appointment of the Rev. Richard Welton, a high-church Tory and Jacobite. Welton attacked Nonconformity and spurned the area’s recent Huguenot immigrants: ‘This set of rabble are the very offal of the earth, who cannot be content to be safe here from that justice and beggary from which they fled, and to be fattened on what belongs to the poor of our own land to grow rich at our expense, but must needs rob us of our religion too.’ When this was quoted by G. Reginald Balleine in 1898 he added ‘how blind this prejudice was … May we learn the obvious lesson for ourselves!’. Harking back to the Laudian spirit, Welton made beautifying alterations, moving the font and altering pews, and attracted controversy in 1713 when he placed a painting of the Last Supper by John Fellowes in the church as an altarpiece. Judas was prominently represented as a likeness of Bishop White Kennett, an antagonist of Welton’s. Through the Bishop of London, Kennett saw to the altarpiece’s removal in 1714. The same phase of works included an organ by Christopher Schreider, perhaps also the west gallery in which it stood. The organ case was later described as ‘carved and gilt, with carved oak trusses and gilt cherubim, surmounted by four richly-carved and gilt figures’  The gallery front sported a finely carved wood panel depicting King David playing the harp flanked by musical instruments. This survives close by in the church of St Botolph Aldgate. Refusing to swear loyalty to the Hanoverian succession, Welton was deprived of his position in 1715. 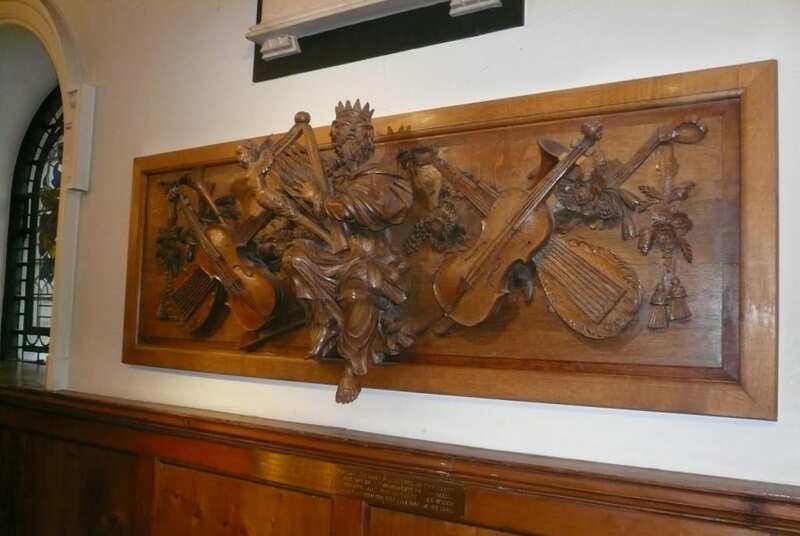 A few fragments from the church survive, including this carved wood panel of King David with musical instruments that was made to grace the front of an organ gallery in 1713-15, now close by in St Botolph Aldgate. Under a succession of latitudinarian rectors Whitechapel’s church appears to have steered clear of further controversy making it a quieter but duller place. It was repaired and beautified in 1735 and again repaired, in what was a wealthy parish, with funds raised through an Act of Parliament in 1762–3 when the tower, possibly unstable, was to have been cased in Portland stone – it was probably rendered instead. The clock stage gained aedicules and a large cupola took the place of a small bell turret. Similarities with the exactly contemporary St George’s German Lutheran Church on Alie Street suggest that the carpenter–architect Joel Johnson may have been in charge of this project. He had property, perhaps a home, round the corner on what is now Whitechurch Lane. 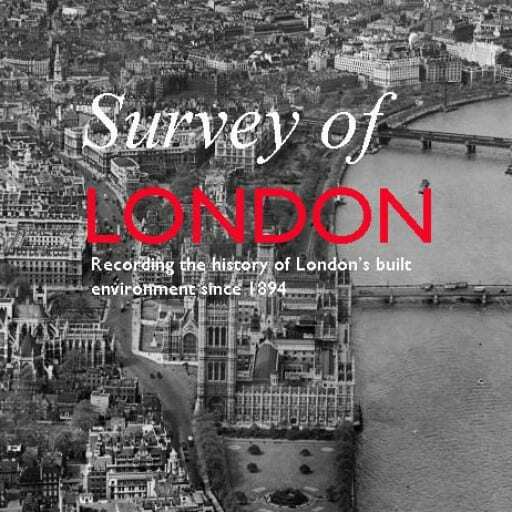 There were further expensive repairs in 1805–6, with James Carr as surveyor. Structural rescue involving iron tie rods followed in 1825–6, with John Shaw (the elder) the surveyor this time. Even so, the tower became dangerous. James Savage acted as surveyor for yet further repairs in 1829–30. In 1839 Edward Blore reported on the state of the church and recommended rebuilding. Discussion was adjourned for a year, but not resumed, the notion presumably deemed too costly. From 1837 to 1860 the Rev. William Weldon Champneys was Whitechapel’s rector. An evangelical, he started with a congregation of about 100, in a population of 36,000, and by 1851 had built attendances up to more than 4,000 across three services on a Sunday. He brought numerous reforms to Whitechapel, from a Sunday School and Mothers’ Meeting, to a Coal Club and Shoe Black Brigade, attempted to convert Whitechapel’s many Jews, and battled cholera and house farmers. Champneys also divided the parish, founding three new churches. The tower was again and for the last time repaired in 1865. The subsequent history of the church will follow in a second post.